Tress are one of the best resources we have for fighting climate change. They help us manage the unavoidable effects of a warming world and help us avoid the unmanageable. As we continue to see more dangerous heat waves, trees provide shade and cool relief. As storms grow stronger and more frequent, trees break the wind, soak up tremendous amounts of stormwater, and reduce erosion. Trees also slow climate change by removing carbon dioxide from the air, storing carbon in the trees and soil, and releasing oxygen into the atmosphere. The value of trees goes far beyond fighting climate change. They provide habitat and food for wildlife. They improve air quality by filtering pollutants. Neighborhoods with more trees experience less crime. They make communities more pleasant, and they increase the value of nearby homes. People go to great lengths to keep living and working near beautiful trees and forests, helping build neighborhood connections as people continue to live near each other for longer. Whenever you can, plant native trees that grow to be large and store carbon faster. Sweetgum, tulip poplar, oaks, and maples are good examples. If you own your own home and yard, plant trees especially on the west and southwest sides of your home where they can provide shade during the hottest time of day. 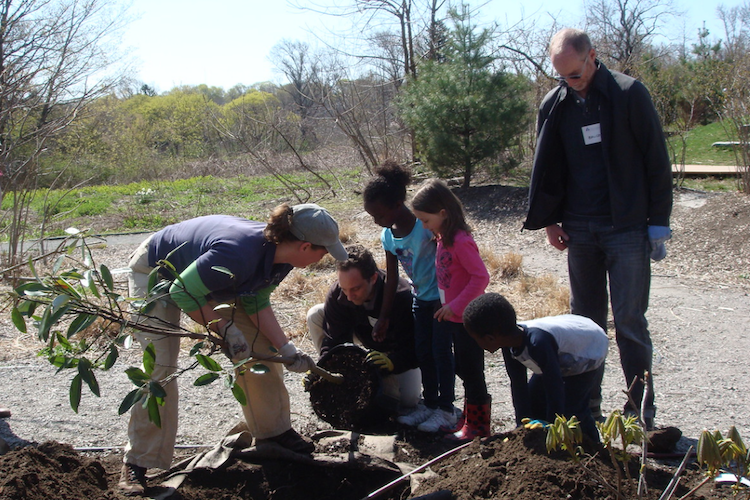 If you live in an urban area, see what neighborhood groups plant trees and give them a hand. Trees provide greater benefits as they mature and grow, so it’s important to help young trees survive through the first 3-5 years. Especially during prolonged dry periods, help keep trees healthy by giving them a bucket of water in the evening. Living trees store carbon for a long time, but dead rotting wood releases carbon back into the atmosphere. Therefore, start with longer-lived trees, which hold their carbon longer, and native species, which are well adapted to local conditions. If you’re already the proud owner or steward of trees, care for them with old-fashioned elbow grease. Gas-powered leaf blowers, mowers, and wood chippers, release carbon dioxide and pollutants, that offset some of the benefits provided by trees. 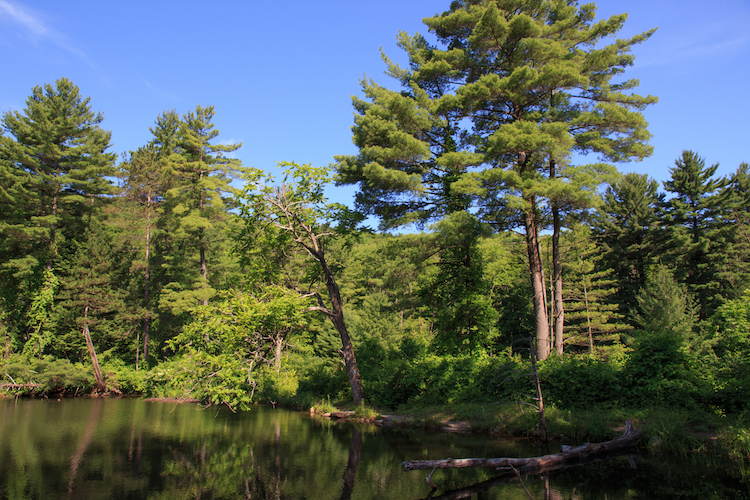 Much of New England has been blessed with the foresight of our grandparents and their grandparents before them to re-establish trees and protect the landscape in perpetuity. We too can continue that New England tradition, and ensure that our grandchildren know the joy of playing beneath sprawling branches on a healthy planet. This entry was posted in Climate, Get Involved and tagged climate change, earth day on April 22, 2018 by Daniel Brown. Daniel is Mass Audubon's Climate Change Program Coordinator. He has worked as a climatologist with states, local leaders, and educators across the country. I have been propagating and planting trees that produce edible nuts and fruit, and other native species, in over a dozen locations in New England over the past two years, including several Mass. Audubon properties: Drumlin Farm, the Boston Nature Center and Long Pasture (on Cape Cod). While my primary motivation for doing this is to add edible native plants in appropriate locations in our landscapes, the carbon sequestration effect of my plantings is a nice fringe benefit. I live in the middle of a dense city and have a small yard. Could you suggest some native trees that would do well in the city, and that don’t grow too wide or tall?